Little is known about the creature called the djinni. Folk tales and legends recounted by the bards and troubadours about these misunderstood beings abound, but most of these sagas are far from the truth. Only the wisest sages in the world understand the true nature of these beings, but even they fail to grasp the essence of their spirits. The Djinni Sage, however, not only understands these intricate creatures, but also forms an unbreakable bond with a specific individual among them. 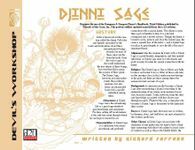 This four page Djinni Sage Prestige Class PDF is an easy-to-integrate PC class and just the sort of thing needed for DMs to add depth to any great d20 fantasy campaign world and gaming session.